Many young Europeans apply every year for the different programmes the European Commission has to offer. One of those programmes is the EVS (European Volunteer Service), which aims to give them the chance of developing professionally (and personally) through unpaid and full-time voluntary activities in foreign countries. This was a part of the Youth in Action programme that finished in 2013 but it will continue to exist thanks to the new Erasmus+ programme (starting on the 1st of January, 2014).To mark the end of the Youth in Action programme in 2013, two members of the E&M team reflect on the EVS, giving an insightful perspective on the feelings and implications of participating in it. Olimpia Pârje, originally from Romania, has been our Project Manager for the past year as part of the EVS programme. On the other hand, Edgar Gerrard Hughes, from the UK, will take over her role during 2014 as part of the same programme. The following interview sees them exchanging their ideas and feelings about the past and future of their time in Berlin. 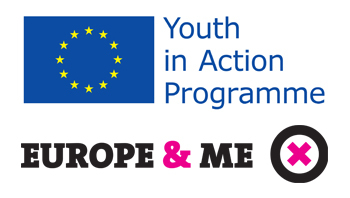 Photo: Youth in Action, Europe & Me (logos) The European Voluntary Service has been a part of the Youth in Action programme until 2013 and will become a part of the Erasmus+ programme as of 2014. E&M: How do you think the EVS programme helps build a “European identity“? OP: I’ve always felt quite European to be honest, but it was always from the comfort of my home in Bucharest, with the occasional travels to different cities. It was during the EVS that I felt I was truly living the European dream – living in another country, having a great group of international friends and co-workers plus the extra travelling around Europe every few months. What more can you ask for? In particular my EVS project was focusing on European awareness and European citizenship – and all my work was related to the European sphere. With my European identity already formed, the EVS contributed more to my understanding that there are different ways to be European. EGH: Plenty of young Europeans have spent time exploring unfamiliar corners of their continent, but most do so as travellers or tourists. I see EVS as a chance to experience a different region of Europe not as an outsider but as a fellow European: to embed yourself in a community, learn its language and understand the patterns of its daily life. By gaining a deeper understanding of the differences between Germany’s culture and my own, I hope I will also learn to appreciate the similarities that unite us as Europeans. E&M: Why are projects like this, that promote solidarity and volunteering, important for young Europeans? OP: I believe there is nothing more promising than the heart of a volunteer – the willingness to put down your time and contribute to a cause, with no direct personal gains, instead of simply going out with friends or watching TV all the time, is not such a common thing. The motivation necessary for working for months or even years as a volunteer is certainly rooted in a deep personal belief in the projects the volunteers choose to spend their time on. And the biggest challenge maintaining motivation in difficult times. No matter in what shape, a volunteering experience is truly character-building – it’s the kind of experiences that makes for more caring and more active citizens – the kind of people that will be the first to raise their hands when they are asked for help. And these are the kinds of people I want to share the continent with. The EVS programme is simply the ideal environment to make this happen – combining the voluntary experience with the exciting time of living abroad and gaining a real international experience. The best way to experience a European lifestyle and I would recommend it any time. EGH: My generation is in many ways an anxious one, and understandably so: we are emerging into adulthood in a continent where jobs are scarce and the future is hazy and precarious. In this environment there’s a danger that our ideals and ambitions contract until they concern only our own future stability. We all need to fight that by cultivating a sense of commonality. International, community-focused projects like EVS are hugely important in that fight. E&M: How do you feel about moving to another country to participate in the project? OP: I was incredibly excited to move to Berlin. For the two months before my arrival it was all I could think about – although I had little consideration for the actual practicalities – like finding a flat, or trying to learn some basic German to get around during the first days. 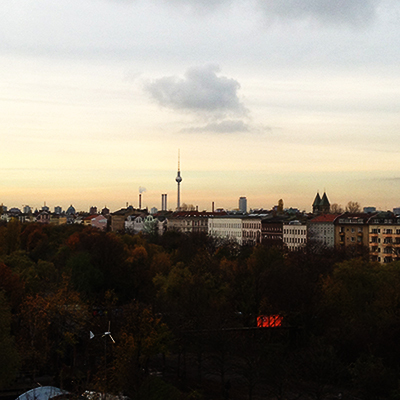 I was already in contact with the Europe & Me team so by the time I got to Berlin I was fully integrated in the project. Photo: Matt Shearman (all rights reserved) Berlin is one of the many destinations chosen by young Europeans, including Olimpia and Edgar. EGH: Excited: it’s an adventure I’ve been craving for many years. I can’t wait to fall in love with a new city, make new acquaintances and immerse myself in a culture other than my own. I’m ashamed to have made it through half my twenties without becoming proficient in a foreign language, so I’m eager for the challenge of improving my German. I hope also that living abroad will teach me something about myself and the culture of my own country: I’m curious to discover which aspects of everyday life in Britain I will feel the absence of abroad. E&M: What are the expectations behind an experience like this? OP: I’ve been involved in European youth work for a long time, having volunteered within AEGEE-Europe – The European Students’ Forum for already 5 years, so I knew what to expect from the EVS project and was familiar with the programme requirements and ideas. I was pretty clear about what I wanted to do, and my particular project was tailored to my wishes and the organisation’s expectations as well so it was the ideal environment to work in. I’ve wanted to do an EVS since I first heard about the project some years ago, but it wasn’t easy to find the type of project that I wanted. I considered myself very lucky because I found the organisation that fitted my plans purely by chance. Designed as a voluntary project yet also bringing some professional experience in my own field of interest – I surely got out of the EVS project everything I expected, and more. EGH: From Berlin? Cold weather, currywurst and a lot of idealistic PhD students and artists. From EVS? An enjoyable challenge; beyond that, I don’t yet know. E&M: Does it bring something to your professional and personal experience that you couldn’t get without the programme? OP: On a personal level the EVS programme gave me the time and the environment to reflect on my life plans and to gain more confidence in myself and optimism to put my efforts into following my dreams. As a very practically-oriented person I always had doubts about the financial and social security of working in the NGOs or in the European Affairs field for example, but these 10 months spent in Berlin gave me more confidence to follow through with my goals, regardless of the difficulties I may face along the way. EGH: I believe EVS will provide exactly the right balance of freedom and rootedness to allow me to explore a foreign country. But besides planting volunteers firmly in a specific environment, the programme also gives us a connection to the continent beyond. I can’t think of any other experience that combines those two aspects of cultural exploration so well. E&M: Is this a life-changing experience? OP: More than a life-changing experience I would say my EVS time was life affirming. I managed to bring to life a dream and put down the foundations for the next adventures. The people I’ve met during the EVS are the kind I will hold as friends for the rest of my life. More than my Erasmus experience, that happened when I was barely 19 years old, at 24 my EVS experience found me more mature and more confident to try new things. And this allowed it to become the best time of my life so far. EGH: To live in a foreign city for nearly a year and come out unaffected you’d have to be impressively resilient to change! Thankfully I’m more impressionable than that, and I have no doubt that EVS will make me think about myself and my world in new and unexpected ways. The E&M EVS project is made possible thanks to our partners and hosting organization Citizens of Europe e.V. Is The Media Screwing Over Women?